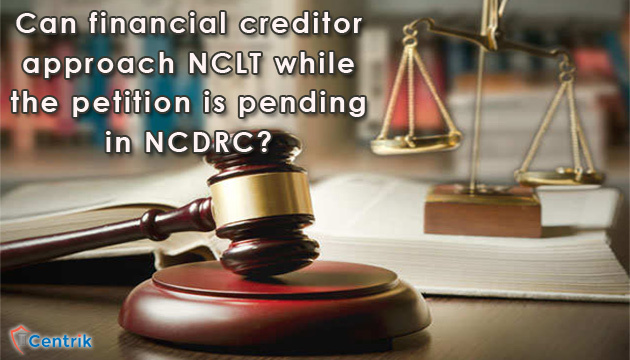 Can financial creditor approach NCLT while the petition is pending in NCDRC? CentrikBlogsLegal AdvisoryDebt Recovery ManagementCan financial creditor approach NCLT while the petition is pending in NCDRC? Insolvency and Bankruptcy Code, 2016 (IBC) was enacted with the objective of ensuring the promotion and protection of interest of stakeholders and creditors of the corporate debtor. All the creditors had the right to file the insolvency petition against the developers’ or builders’ company except homebuyers. The real estate market is full of builders or developers who defrauded so many homebuyers by not delivering the physical possession of the unit or property on time. The builders also failed to refund the amount deposited by the homebuyers against the plot/unit/possession. Earlier homebuyers did not have any redressal forum, thus almost all homebuyers used to approach consumer redressal forums to seek the refund or physical possession of the project along with the imposition of fine. Thus there is plethora of cases which are pending in various levels’ consumer forums. To provide a specific relief to the homebuyers and to curb down the fraudulent practices adopted by the developers, the legislation of Real Estate Regulatory Authority (“RERA”) took place. Under RERA every type of homebuyer/unit buyer could approach the RERA against the developer who defaulted handing over the physical possession of the property against which the homebuyer made the payment. Under RERA, homebuyers have the right to either claim the physical possession of unit/flat/property or can seek the refund of the amount paid by the homebuyer to the builder. Unfortunately some deficiency in the RERA execution procedure has not been proved much viable option for the recovery of amount. RERA is more oriented towards project completion. What amount those homebuyers who want their money back? Keeping in mind the above said difficulties, the legislation came up with the amendment dated 6th June, 2017 into IBC according to which the homebuyers received the status of financial creditors. Now, the homebuyers who wish to seek refund of their amount are legally entitled to approach National Company Law Tribunal (NCLT) under IBC. The homebuyer can file the application to initiate Insolvency Resolution Process against the builder/developer. What if, the case is pending before the NCDRC or any other State Consumer forum? If any case is pending before NCDRC or any State or District consumer forum even then the homebuyer can approach NCLT under IBC. As per section 238 of IBC the IBC has the overriding effect over other laws due to which adjudicating authority has the jurisdiction to deal with any cases pending before the consumer forums. Once an insolvency application gets admitted under IBC, then all the other proceedings pending before other forums or courts are stayed. The adjudicating authority has rightly dismissed various contentions about the pendency of case under any consumer forums or any court of jurisdiction, made by the corporate debtor. In cases like Smt. Alka Agarwal & Ors. Vs. Parsvnath Landmark Developers Pvt. Ltd. the NCLT has admitted the insolvency petition filed by the homebuyer even though the same case was pending before the NCDRC. Keeping in mind all of the above provisions and decisions held by the Adjudicating authorities, in my opinion it is prudent to approach NCLT to commence insolvency resolution process against the developers’ or builders’ company.